Life could be good, if we only knew how to be strong inside, if we were brave enough to use our voice and we were powerful enough to withstand the great forces of energies that pressure our soul. Life would be grand if we knew how to balance what we give away of ourselves, if we knew when people were taking advantage of us, and we felt worthy enough to pursue our passions. Life would be different if we weren’t wounded by the ones we love, if we didn’t have to deal with things like gas lighting from people, that everything we intuitively knew wasn’t right, someone wasn’t trying to make us believe it was our imagination or a lie. Life would be a blessing if the toxic people we know wouldn’t use projection as a tool to mask their responsibilities to their actions, and they would stop deliberately misrepresenting our thoughts and feelings to the point of absurdity. Life would be wonderful if we were strong enough to challenge or even walk away from people who are constantly changing the subject to evade accountability, it doesn’t always have to be about ‘them’ and it is not normal to feel threatened by these people when they tell us that we are not living up to their impossible expectations. Life would be peaceful if people would stop calling us names, it is such a quick and easy insult that they use to degrade us and insult our intelligence, why does it have to be necessary for people to name-call to criticize our beliefs, opinions, and insights! Life would be in our own power if toxic people would stop trying to condition us to associate our strengths, talents and happy memories with abuse, frustration and disrespect, if they stopped with their put downs and stopped sabotaging our goals, and even ruining celebrations, vacations and holidays. 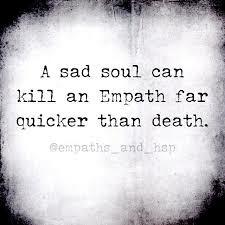 Life would be happier if narcissists, sociopaths and psychopaths would just leave the empaths alone, so we could do what we came to this planet to do, to spread love and compassion to those who are ready to embrace a happier and healthier life for themselves, so we may all move into this world with self empowerment and be of service to human kind.